well, now that i am back home i am feeling the guilt of sucking at posting during my trip. in attempts to alleviate this feeling, i'm going to post photos (and some stories) now. i uploaded some photos to facebook, but it's sort of hard to tell stories there so... i'm going to try here. our first class field trip to the athens archaeological museum. this is the "mask of agamemnon," that we learned about during our first lecture. a german millionaire named heinrich schliemann was obsessed with the trojan war and spent tons of money trying to find proof that it occured. at the site of mycenae, in grave circle a, he claims to have found this, which he identifies as the "mask of agamemnon," but it's slightly unconvincing because 1- its condition was too preserved to be believable 2- the mask's mustache is almost identical to mr. schliemann's himself. artemisium zeus, made of bronze and completely free standing. i have to be honest and say that Athens was not my favorite city. i really loved the contrast of the ancient acropolis to the modern city, but after you get over the splendor of the parthenon, athens is just dirty. there was a small area, however, that was quaint though touristy- called the plaka. 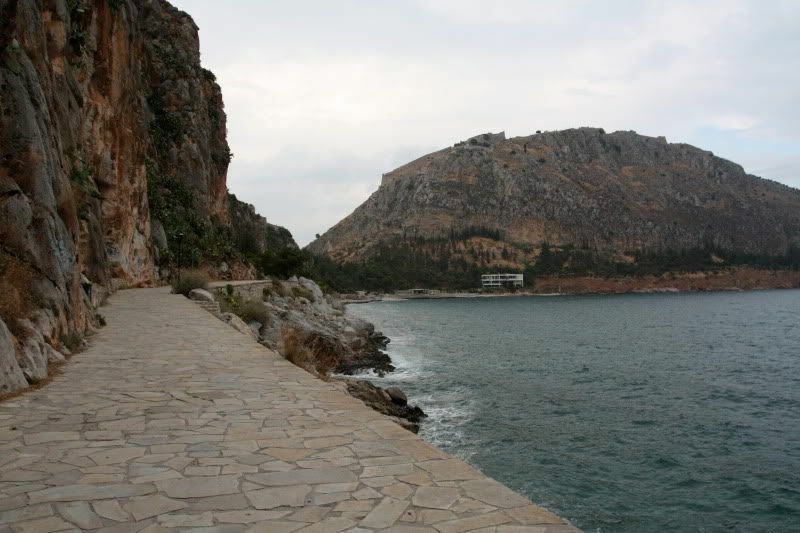 the photo above was an entry way from the hill of the muses down into the plaka. while walking down this entry way, i saw this written on the wall. even though i've taken 2 years of ancient greek, it is pretty much nothing like modern greek. luckily, i happened to know these two words on the spot to appreciate how wonderful this is. i think i'd enjoy graffiti much more if all of it said "i love you very much." when the girls and i finally made it to the center of the plaka we were starving and just looking for some place to eat. as we were passing this restaurant, this man (pictured above) says to us, "kumusta ka?" which is tagalog means "hello, how are you?" of the girls in our small group, justine, jamie and i are filipino and hearing this we were slightly shocked that a greek restaurant owner knew taglog. after talking to him further, we found out that his grandfather was filipino so he was a quarter pinoy and he visited the philippines often growing up. along with tagalog, he also knew "English, Spanish, French, Italian, German, Dutch, Arabic, Portuguese... and a little Greek." he said he learned most of the languages going to a private school when he was younger and once you learn a few languages, all the others come easily. he also takes 4 months of vacation every year during low season and travels the world. amazing, right? who needs urban outfitters when you have the plaka to rip you off? not much of a story here, just some really nice paintings up for sale along the street. one very large post to come dedicated to the strays of greece. i know this athens post doesn't have the parthenon or any of the ancient acropolis here yet, but i'm trying to go in chronological order of my trip. so.. up next, nauplion! I still don't have any photos to put up because my computer still isn't connected to the internet, but I just uploaded 854 photos from my camera onto my hard drive. When my UCLA program ended in Greece I thought that I was going to be taking a ferry from Greece to Southern Italy, then a train up to Munich. Then I found out that I couldn't purchase a ticket online, so I was in crisis mode because I had 4 days to figure out how to get to Munich. I was going to just fly and then stay in hostels there, but I couldn't figure out the German websites and they all seemed to be filled. Then I remembered the Athens hostel I stayed at before the program started and walked over there to see if there was still room, but there was none. On my walk of dejection back to the hotel I suddenly remembered that I had a friend that may or not be in Munich, but that she studied there for a year. I knew it was highly unlikely that she was still there or if she would respond to my message at such late notice, but I messaged Kerstin and within 10 minutes she responded back letting me know that yes, she was in Munich, and yes, I could stay with her on her dorm couch. So I flew to Munich the next morning and met up with her off the S-bahn and even though everything planned turned out to be a nightmare, I think that everything with Munich and Kerstin was nothing short of a miracle. She and I had 6th grade together so we hadn't really seen each other for 8 years, minus one breakfast together. These past few days with her and her boyfriend, Imad, have been wonderful and I'm really glad everything worked out. sorry for the lack of posts, i can't access the internet with my computer so i have to borrow my friend's. i will post tons and tons of everything when i get home in 2 days. 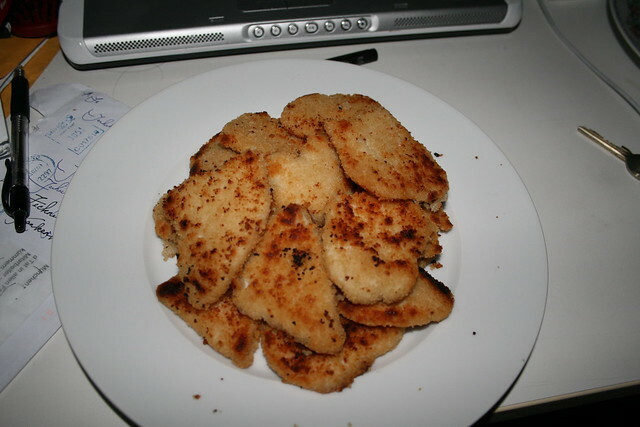 in the mean time, here's a photo of my first schnitzel. i love it. $510 change of flight ticket to come home early. hopefully i can get internet soon and show you philip II's tomb from back in vergina and some shots of istanbul, city that is beautiful but filled with bad men. Okay I’m terrible at posting. I want to write everyday, but posting pictures is a hassle so I never post because I want to post with pictures. As of now, I’m very behind at uploading my photos. Today we went to Aegena, which is an island off of Athens. We went to see the Temple of Aphaia which only took about half an hour, and then we spent the rest of the time exploring town and going to the beach. A few of the girls were hungry so they went to eat, but Kacy, Chris and I tried to find the beach. We eventually ran into other people who cliff jumping and we jumped off! I was scary looking down but cool once you did it. Our friend Jamel paddled by on his kayak, got tipped over and I got on the kayak and was pushed around like a princess (hahahah). Eventually, everyone but Chris and Jamel left and we hung out for a little until we decided to go eat. We met up, ate, then took a hydrofoil back to Athens. I will post these pictures soon… I’m actually planning to stay up all night since we have a 6-8 hour bus ride tomorrow where I can just sleep. But for now, here are some photos back from Nauplion. Since Nauplion, we’ve been to Sparta, Olympia, Delphi and back here to Athens.. so I’m really sorry for lagging so bad. These photos are from the nightlife out on the strip- mostly of my new friends here while playing with my night-photo skills. Justine, "So why aren't you dancing." Chris and his delicious Amstel. Well, it has been difficult to get internet here lately, but I finally somewhere where it's possible to upload images without waiting forever. Now I only have to wait half of forever. I don't think I can write specifically everything that has been going on lately, but here are some photos with captions that will hopefully give you a glimpse of what I've been up to. These days are going by so fast! The Temple of Poseidon on Cape Sounion. When we got on the bus, I thought it was only gonna be a 20 minute bus ride. It turned out to be an hour and a half, but it was perfectly okay because the coast was so beautiful. Unlike Bay Area beaches, the Mediterranean is so blue and clear and looks like it would be comfortable to swim in. Bottled Coke- my beverage of choice. Delicious and so cute in their mini bottles here. The Stadium at Epidarous. Tons and tons of steps, and here is my view from the top. The entire city-state would come together here and watch a performance. I was offered 10 Euro to go down and sing from the center, which I politely declined. Nauplion, my favorite city so far. A beautiful little coastside town. Hadley swimming during our first day there. Trees along the port walk. Biking our last day in Nauplion. As you can see, one side of the path, but what you can't see, is that the other side of the path is the ocean. We left Nauplion a few days ago and went to Sparta, and we're now in Olympia. Photos from those coming soon- though too be honest, they are not quite as charming as Nauplion. I have some nice people-photos. Being here is very beautiful, but some days I still miss home. so, i'm sorry about being so terrible at blogging. it's a little difficult when your internet is inconsistent and you're always out and about. i am planning to post photos from Nauplion soon-- it's a gorgeous little town.